Well, it could certainly be argued that Hawking may not have got his point across well on this occasion. He’s believed to have made similar observations in previous, not-quite-so-global environments, both in more detail and with greater clarity. Perhaps this was his fault, perhaps it was the fragmented, social media, nature of the Reddit session; but the comment was easily picked up in isolation and trivialised, then reported as superficial and misrepresented as ‘Those nasty capitalists are going to replace us all with robots’. It’s much easier to find a counter-argument once you’ve repackaged the original argument in a form that suits you. The automated world we’re about to enter will be very different to the present one; the traditional model of the changing workplace may not apply. If the robots take the old jobs, they may take the new ones too. The numbers, the scale of all this, will be unprecedented, as may be the wider social upheaval. Alternatively, the existing economic frameworks might not change at all – which could be even worse for most people. In both respects, people aren’t using the term singularity lightly. In today’s world already, in fact, a number of people don’t work – or do very little. But, as a non-worker, how society treats you depends largely on who your parents are. It could be argued that, on the whole, current unemployment figures don’t include people who don’t need to work. However, whichever way you do the calculations, unemployment is generally fairly low. Most people work; and most of them work in difficult conditions, for too long, for low pay, largely for the benefit of either the more fortunate non-workers or much better-off workers. The ever-present threat is that this mundane existence is better than the alternative: that of becoming part of the less fortunate non-working community. These non-workers are generally despised compared with their affluent counterparts. In fact, non-workers make up the two extremes of the social spectrum. 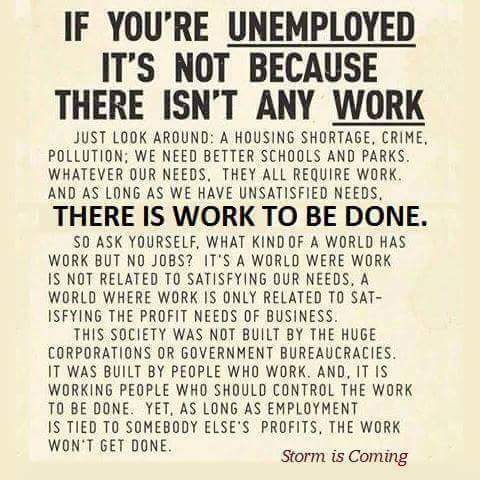 Now, project this model forward into a future in which the majority of people don’t work. Say, for the sake of argument, that unemployment rates of 10% become more like 90%. The economists will howl at these figures but the roles are reversed now: it’s the economists that don’t understand the significance of the technological singularity. With existing economics, can the majority of the population be supported to do nothing? (Or meditate or write poetry or play sport or something – although there’s a possibility the machines might be better at that too.) No, of course not. Because everything in the world today revolves around the competition to make profit. Nothing much happens if there’s nothing in it for someone. It’s anyone’s guess what might happen to a majority superfluous workforce. 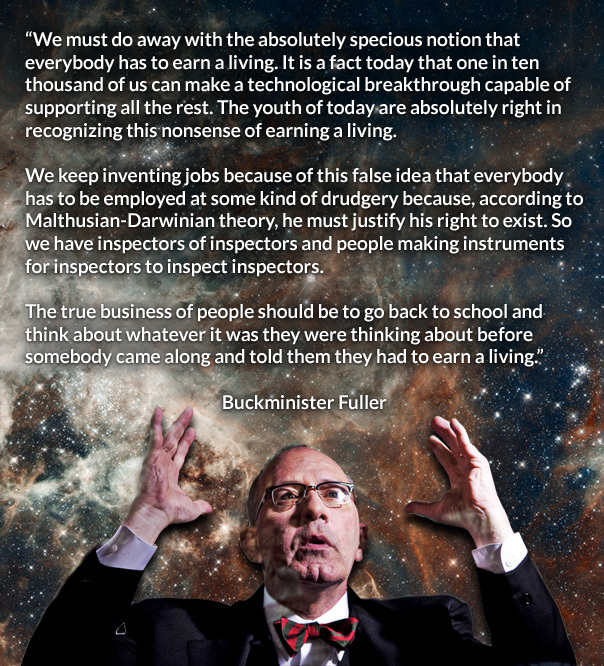 The only non-workers that will get by, just as now, will be those few that don’t need to work. That simply cannot be a stable system. There’s nothing essentially different to today in terms of the definitions of ‘haves’ and ‘have-nots’ but the balance will shift hugely in a numerical sense – probably well beyond the catastrophe point … another singularity or revolution to use different terminology. Now, if we’re going to change any of this, there’s some considerable thinking-outside-the-box needed here. But when scientists, who are generally pretty good at that sort of thing, dare to try, it seems that they get slapped down by economists who are all-too-ready to point out that they might not understand the niceties of current economic models. No, they probably don’t. No, they’re not trying to. They can see that something much bigger is about to happen and the response can’t be conventional. But when a physicist starts to talk about AI and unemployment and politics and economics, taking the piss is very easy indeed – particularly if you’re coming at it from being a beneficiary of the current system, and desperately not wanting it to change. But, it’s going to have to change and to start that process involves throwing out a lot of old, comfortable assumptions about the way the world works. Around the turn of the millennium, there was a British car manufacturer with a strongly unionised workforce. Rampant anarcho-syndicalism it wasn’t, but the workers did have a little more power and more say in what the company did than many elsewhere. Slowly they were able to improve their working conditions. The result was that the owners had to make more concessions to the workers, which meant less profit. Both factors led to a drop in quality in cars rolling off the production line and unrealistic prices compared to their competitors. Eventually, the company went bust. The result still stands as a case study in how not to do business. In fact, it’s often noted that, by the end, ‘the workers thought the company was there to give them work, rather than make cars’. But … can we just for a moment entertain the idea that this might be a good thing? Why shouldn’t we have structures that put people before profits? If we’re not competing successfully against slave (sometimes even child) labour in other parts of the world, where really is the flaw in the system? Here or there? In a capitalist system, nothing happens unless there’s a profit in it for someone; that’s what drives the system – the whole world. Is it really impossible to reverse the logic? In an economic system that looked after people first, would we care that much if the cars weren’t much good? Well, the elite non-workers might but few others would if they were properly fed and living in peace. The elite would bang on about personal freedom – the rest of us would ignore them. To put it another way, a good sub-system, failing within a bad global system, isn’t a bad sub-system: it points the way to a better global system. In fact, there is work to be done, whether it be by humans or robots, but it’s not being done at present because it isn’t profitable. Our hospitals and local amenities are falling down but they’re not being rebuilt because the economics aren’t worthwhile. People are starving when there’s food to feed them and dying when we have the medical knowhow to treat them but neither is happening because it doesn’t pay. It can’t be denied: profit comes before people in the world today. How can it even be moral to talk about the cost of a drug that will keep someone alive? Particularly when that cost can be considerably less than the elite throw away on a whim. It can’t. It isn’t ethical or moral: it’s economic, laced with politics. It’s capitalism. 1. The old jobs will be replaced by new ones. No, not this time. 2. Don’t say nasty things about capitalism. Sorry, we have to: it’s going to be the death of us. 3. Scientists should stick to science. Well yes, there is some sense in this and, in fact, we’ve made the point before. But there’s nothing worse about a scientist making social comment than an economist doing the same. The economist is simply blinkered by the belief that our society and economy are the same thing, always will be and always have to be. Escape the notion of profit being the first and last word in everything and an economist is just an expert in playing Monopoly. They have no more insight into social structures (including possibly those with robots) than a scientist, or a poet, or a footballer. 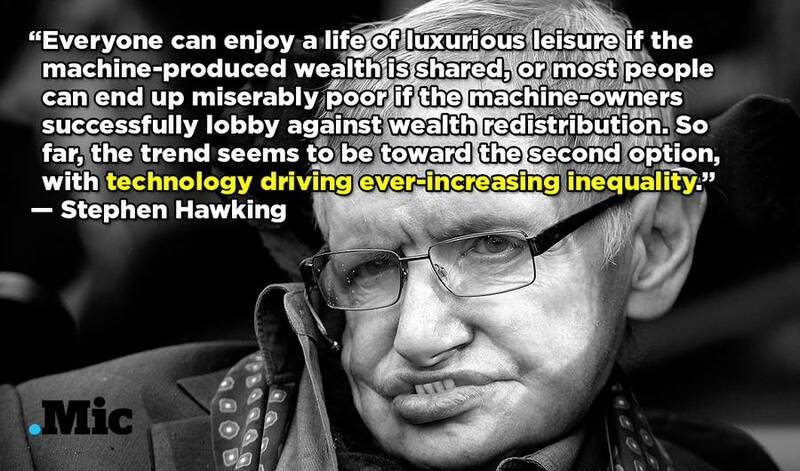 But Hawking is right. Technology does have the potential to give us all a wonderful future. But it won’t; not unless we’re prepared to change the framework we’re going to place it in. If we don’t, it will make things worse. This entry was posted on Thursday, November 5th, 2015 at 9:46 pm	and tagged with Automation, Capitalism, Employment, Technological singularity, Unemployment and posted in Engineering, Hardware, Industry, Philosophy, Politics, Science. You can follow any responses to this entry through the RSS 2.0 feed. A high tech robot may be quite expensive to purchase, maintain, and operate. Do we really want one to sweep our floors? No, send a human, they are cheaper!